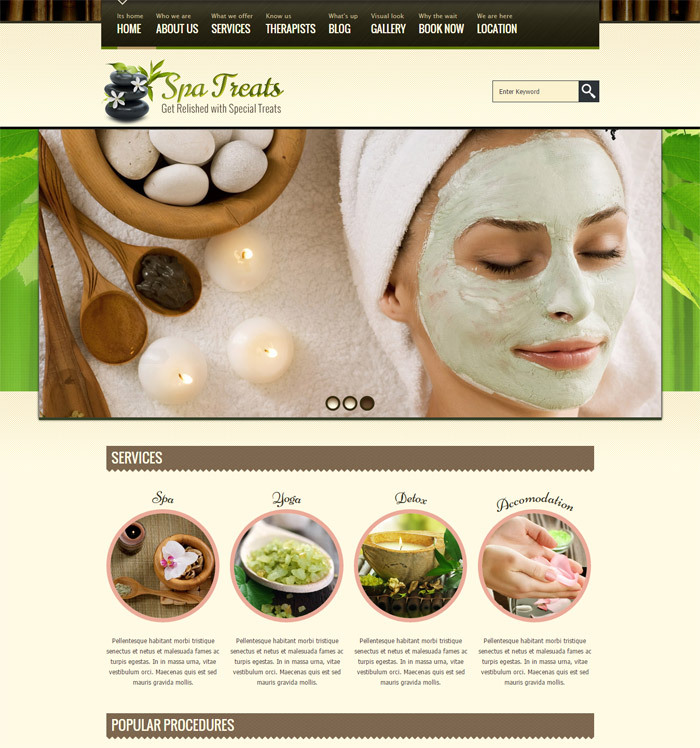 Web templates in HTML are very appropriate for retail themes such as spa, travel, medical and restaurant segments. The reason: Ease of use in customization from the generic template. HTML templates offer the designers many advantages like color combinations, rich audio and video visualization so important in retail templates . The computers communicate with each other using HTML language. If someone had a computer and a phone line with broadband or any other type of connectivity, using HTML and web browsers, they could surf the web! HTML is the basic method for creating websites and web pages. Even with the advent of many sophisticated Content Management System (CMS), HTML still continues to rule the roost because of its simplicity and functionality not to mention anything about its rich color combinations and dependable design structure. Check out our selection of “10 + Latest Best Selling HTML Retail Web Templates” and pick one for your unique and special needs, sharing your success stories with us! Spa Treats – A Health / Spa Salon HTML Template: Spa Treats is a Fresh HTML Template with Exclusive features. If you are looking for a Trendy Spa Salon kind of Website ‘Spa Treats’ in the best fit for you. It has all the features you need to start a Spa or Saloon Business or promote an existing Salon. This HTML template is unique in design; take a look at the preview and you will feel it. Google Fonts used, 19 Fully Validated HTML Files, jQuery tool tip, Smooth Transitions on mouse over, Exclusive pages like Popular Procedures, Services, Therapists & Book Now, jQuery validated forms, SEO Optimized, 2, 3 & 4 Column Gallery Pages with and without sidebars, Licensed Isotope jQuery filtering in Gallery pages, Exclusive Style Page Includes, Column based Content display, Block Quotes, Various types of lists, Smooth Tabs and Accordions, Table Displays, Various colored buttons of different shapes, Exclusive Big Icon Button of your choice, Tool Tips Examples, Left and Right Aligned Content Display, Coded for WordPress Standards, 404 Page Included, Works well in Major Browsers. MediCenter: MediCenter is a responsive HTML template suitable for medical and health related projects or businesses. The Template is maintained in a minimalist and modern style with strong color accents. The Template comes with wide and boxed layout – both fully responsive and optimized for all kind of devices. The Template is Crossbrowser compatible. The template comes loaded with more than 20 different page layouts including blog with comments, about page, team page, department’s page, timetable or schedule page, gallery with different layouts together with single photo page and a contact page. An extensive collection of shortcodes lets you build subpages by using the existing components. ZIP file contains PSD source files: complete PSD template plus all of the icons used within a project in full PSD vector! After Sales Support: We offer 100% free after sales support. Once you purchase you can use our Support Forum backed by professionals who are available to help our customers. Extended Features List: Responsive Design, jQuery Powered, Wide and Boxed Page Layouts, 20+ Page Layouts, 6 Homepage Layouts, Custom Shortcodes, Timetable, Departments, Blog with Comments, Different Gallery Layouts, Ajax Appointment Form, Map of Location, 50+ Icons, Latest Tweets, Support for Videos, Font Face Fonts, Crossbrowser Compatible, Layered PSD Included, Clean Design, Documentation Included. Key Features: Priority special pages: You can use Priority as medical, spa, education, restaurant, attorney, church, fitness, hosting, real estate and travel! FAQs, Tabs, Accordions, Coming Soon Page, Login Form, Registration Form, Full Width Page, Left Sidebar Page, Right Sidebar Page, 404 Error Page, 2 Columns, 3 Columns, 4 Columns, Blog Index, Blog Post, Portfolio with and without filter, jQuery Enhanced, 2 Contact Page Designs, Well Documentated. Dedicated Support, Cross Browser Support, All Files are Well Commented, 28 Layered PSD files, All PSD files are fully layered and neatly organized. Cutting Edge – Responsive One Page Parallax Template Description: Looking for something unique and cutting edge for your salon, have a website that portrays and compliments your business, and then please check out Cutting Edge – Responsive One Page Parallax Template. Designed to suit hairdressers, beauty salons, massage parlors & day spas this site is very flexible and is easy to use with loads of great features. It has been designed to make it easy to customize. Features: Black or White Versions, Fully responsive web design for all devices, Parallax scrolling, Fullscreen slideshow, Directional Hover Gallery with pretty photo lightbox, Advanced CSS3 animations, Accordion Specials section, Google Web Fonts, Google Maps Integration, Prefix Free CSS (no more Webkit or moz), Fully working AJAX/PHP contact form, Flickr feed, Twitter feed, Compatible on all major modern browsers, Well documented. Bella Motel – Restaurant & Bakery Responsive HTML: Bella is an Elegant, Responsive HTML5 Website Template Design for Restaurant, Bakery and Food Business. It has elements like Menu, Pricing Table, Testimonials, Gallery, Reservation, Products, Shop Pages, Blog, Team and tons of short codes to build your Restaurant or any Food Business Website in Minutes. Comes with 3 Unique Color Options and Pattern Combinations. Full-Width and Boxed Layout Options, Premium Sliders, Mobile Menu and More…W3C Valid HTML5 and CSS3 Markup, Cross Browser Compatible, Responsive Design to fit all Devices. Template Features: PSD Files Included, Premium Revolution Slider included, 3 Homepage designs included, 3 Easy to Switch Color Themes Included, Unlimited Layout Options Possible, Unlimited Color Themes Possible, Elegant Multi-Level Drop down Menu, Shop / eCommerce Page Designs, Shop and Blog Designs with 2,3,4 Column, Team / Chef Design, Unique and Modern Blog Page Design, Reservation / Booking Form, Working Contact Page with Google Map, Well Commented and Valid Code, Tons of Short-Codes, Tabs, Toggle, Accordion, Pricing Table, Button Styles, Progress Bar, Lists, Fancy Box, Services. Medica – Doctor, Dentist & Health Clinics: Probably the best HTML theme destined for all the Doctors, Dentists and Health Offices / Centers out there that need a professional yet modern looking website. This HTML template comes packed with medical features that helps the visitors get more from the website, and enables them to interact easier with the website. Key features: Huge amount of page templates can be made using the shortcodes HTML pages. Working contact form. Cross browser optimization (IE7, IE8, IE9, Firefox, Safari, Opera, Chrome). Premium design. @font-face custom fonts. The package contains: 23 XHTML files, 22 Photoshop files used to create the HTML files. Lost World-Travel / Resort / Responsive HTML Theme: Fresh and feature rich responsive HTML template designed to fit the needs of travel agencies, trip advisers travel bloggers and hotels. Unique and clean designs for travel packages, exploring destinations, photo gallery and Blog. Template Features: Exclusive packages page, Wide home page jQuery slider with unique navigation, Package details page with booking buttons, Photo Gallery Page, Unique blog layout, Blog details ,age with threaded comments, Explore/Itinerary Page, Itinerary Details page, Layered PSD files included, Multi level Drop-down menu, Ajax Contact form, Social widget, Pagination Design, 404 page design, Typography page, Tables, Tabs, Accordion, Toggle, Buttons, Column short codes, Image captions and alignments, Multiple Block Quote designs, Heading tag styles, Drop-caps, Ordered & unordered list styles. Book Your Travel – Online Booking HTML Template: Book Your Travel is a responsive HTML Template ideal for booking portals, travel agencies, hotels, bed and breakfasts, guest houses, villas, etc. or travel blogs, but it would suit for any business with slight customizations. Features: Home page with special search box for searching hotels, flights, cruises, self-caterings and car rentals. Search results pages for hotels and flights. Inner page for displaying search results/hotel/flight/self-catering/car rental deals. This page comes with grid and list view. There is also a sidebar and additional navigation for advanced filtering. Responsive Paradise Hotel: Main features: Responsive Paradise Hotel is an HTML5/CSS3 site template suitable for hotels, restaurants, spa and similar. The layout looks beautiful at any size, be it a laptop screen, iPad, iPhone, Android Mobile or tablets. Valid and clean HTML5/CSS3. Responsive layout: compatible from mobile browsers to notebooks and tablets. Try to resize the browser window to see it in action. Flexslider: responsive images slider, Fullscreen Gallery, Fullscreen intro page, Rate room widget, Weather widget, AJAX PHP room availability request form: a request email will be sent to the owner of the site. Note: in the demo the request will be sent to my email account. AJAX PHP room availability Date picker Calendar: Multiple calendar formats, Multiple Languages support. AJAX PHP contact form, Google API web font, Google Map, Responsive Video Support, Pretty box, IE7 compatible, Very easy to edit, JQuery Plugin: Moderniz, Calendar date input, Form exposè, Form Validation, Weather widget. Clinico – Responsive Medical and Health Template: Clinico is a powerful multipurpose responsive template suitable for medical and health related businesses. Its fresh and clean design makes it applicable for corporate websites, personal blogs, product-oriented sites as well. It looks great on tablets and mobile devices due to its responsive design and retina graphics. The template comes with wide and boxed layouts, includes six predefined color schemes which are very easy to customize. Our template comes loaded with a great deal of various page layouts, content elements, working contact form, twitter widget and much more. Highest quality of code, extended and easy-to-read documentation prompt and qualified support are the key features Clinico is standing out with. Key Features: Clean and unique design, Six predefined color schemes, Easy color management, Wide and boxed layouts, Google fonts support, FontAwesome support, Fully responsive, Retina ready, Touch sensitive, Coded with SEO in Mind, HTML5 & CSS3 Validated, Layer slider included, Typography and Shortcodes List, Easy to use Google Maps, 50+ html files, Full browsers compatibility, Ipad and Iphone friendly, Working Contact form, Well documented code, Extensive Documentation, Thank you! Webmarket – Webmarket is a responsive HTML eCommerce template for online shops. It is very easy to setup and use. Main Features: HTML Template for Online Shop: Do you enjoy our theme? We would be glad to publish what you have to say to others. Just drop us a message from our profile. Page Layouts: Webmarket HTML template includes many different page layouts: Front page layout (in four different color themes), Shop layout (with or without sidebar), Single product layout, Blog: Single blogspot. Features: Icons, Search results, about us, Contact us (with working PHP form), Checkout process in four steps, Login and register modal windows (on all pages). The Webmarket template comes with psd files created by professional designer, so it is very easy to add some extra visual elements to the existing design. Scaffolding: Images Used. There licensed images are used in Webmarket: Smiling Group, Thirst, Hot air balloon, Beach Drink, Mobile App Mock-Up Essentials Bundle, Images of the products are not included in the ZIP file for download. Fonts Used: There are two custom fonts from Google Fonts used in the Webmarket HTML template: Pacifico – for the logo “Webmarket” Open Sans – for the headings and links. Crossbrowser compatibility, extensive documentation, revolution slider worth $12, 20 custom HTML pages, video tutorials, awesome support.